Simon Scarrow is a Sunday Times No. 1 bestselling author. After a childhood spent travelling the world, he pursued his great love of history as a teacher, before becoming a full-time writer. His Roman soldier heroes Cato and Macro made their debut in 2000 in UNDER THE EAGLE, and have subsequently appeared in many bestsellers in the Eagles of the Empire series, including CENTURION, THE GLADIATOR and most recently INVICTUS. Simon is also the author of the novels YOUNG BLOODS, THE GENERALS, FIRE AND SWORD and THE FIELDS OF DEATH, chronicling the lives of the Duke of Wellington and Napoleon Bonaparte, and of SWORD & SCIMITAR, the epic tale of the 1565 Siege of Malta, and HEARTS OF STONE, set in Greece during the Second World War. Simon has also co-written two bestselling novel with T.J. Andrews, ARENA and INVADER. He lives in the historic city of Norwich. Lee Francis worked for several years in the world of film, TV and advertising as a script reader and assistant director. PLAYING WITH DEATH, written with his former lecturer Simon Scarrow, is his first novel. 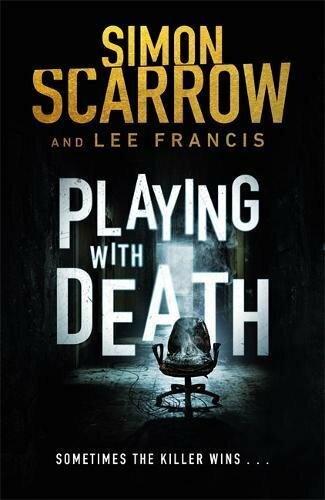 PLAYING WITH DEATH is a gripping, edge-of-your seat contemporary thriller that marks a new direction for legendary historical novelist Simon Scarrow, writing with exciting new talent Lee Francis. Not to be missed by readers of David Baldacci and Michael Crichton. Haunted by a failed undercover mission, Rose is finding it hard to shake the memories of her close encounter with a ruthless serial killer – one who is still free, and could strike again without warning. The call to investigate a suspected arson attack that’s left a man dead is a welcome distraction. It’s not the kind of case usually assigned to the FBI, but nothing about this crime is usual. As Rose digs deeper, she finds herself confronting the sort of imagination her son might see in the fantasy worlds of his video games. But when your opponent is a killer, nothing feels like a game. . . I approach every Scarrow book with caution, Not because of the quality but because I’ve been fortunate enough to know both brothers for quite a few years and have really enjoyed their books. Simon’s books were among my introductory books into Historical Fiction and as such they have to have a special place in my reading and has helped define the reader i am now. So every new book has the potential as a voracious reader of the genre to find a fault, to pick holes and its never something i feel totally comfortable with. Fortunately Simon rarely offers me the opportunity. So when something new comes along, Simon Scarrow doing Crime Fiction, i have to think, Hmmmm? ok! lets give it a go. Also a collaboration, and something adapted from a TV series idea…. this could have car crash all over it, and how do i review that? Starting the book i have to say i was concerned, the writing didn’t have the feel of Simon’s usual work, the writing felt a little clunky and simplistic. But i think as much as anything that was the building of the concept, how to explain it to the reader, and so it came over as talking to the reader, and me projecting my concern onto the concept a little, also reading in bite sized morsels where this book needs to be read in large chunks to really absorb the concept. In Playing with Death, Simon and Lee tackle some really interesting concepts around modern society, social media and gaming. Simon surprises and uses a female as his central figure (not something you would expect from the writer of Macro and Cato, but integral to this plot) and it works very well, if a little male in thinking occasionally, which can fit with the male orientated profession. But the concept of the books criminal and the “Skin” soon takes flight in the book, mixed with the backdrop of the chase for a deadly serial killer with a personal dislike for the lead FBI agent Rose Blake and the misdirection for the crimes happening. The chase gets more and more twisted, the concept of the tech and mix of social media more and more real and uncomfortable building to a thrilling conclusion. Wrapped around this is the family life of Agent Rose Blake, a family that gets drawn into the mix as inextricably as we all do to the world of the internet, caught up in the social media world and all its pit falls. Simon and Lee shine an uncomfortable family light on our personal dependence on Social media and gadgets, that urge, desire to pull out your smart phone to check facebook, to check your email. The drug that is the internet has changed the world and we need to remember to turn it off, to disconnect and be part of a more realistic world, because the fake news, fake world and impossible world of photo shopped celebs and everything of its ilk on the internet all impact and shape our children and ourselves. Its that message that makes this book stand out, makes it a book that i really recommend and helps make this a very good crime thriller.